Integrated Quantum Photonics allows the routing and control of single particles of light with intrinsically high stability and precision. However to date it has been limited to small-scale demonstrations in which only a small number of components are integrated on a chip. It is thus in high demand to scale up the integrated photonic circuits and increase the complexity and computational power of modern quantum information processing technologies that would enable many revolutionary applications. In fact, coherently and precisely controlling large quantum devices and complex multidimensional entanglement systems has been a challenging task owing to the complex interactions of correlated particles in large quantum systems. In an international research effort led by scientists from the University of Bristol’s Quantum Engineering Technology Labs, we demonstrated the first ever large-scale integrated quantum photonic circuit, which can generate, control and analyze high-dimensional entanglement with unprecedented high precision and generality. A programmable bipartite path-encoded multidimensional entangled system with dimension up to 15×15 was demonstrated, where each photon exists over 15 optical paths at the same time and the two photons are entangled with each other there. This multidimensional entanglement system is achieved by scaling up the silicon-photonics quantum circuits via a single chip integration of 550 optical components including 16 identical photon-pair sources, 93 optical phase-shifters, 122 beam-splitters, among other optical elements. 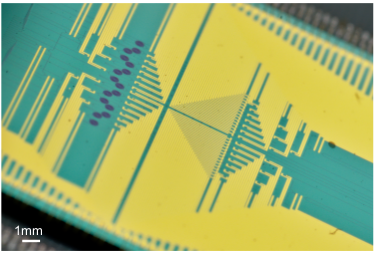 The quantum chip was realised using a scalable silicon photonics technology, similar to today’s electronic circuits, which would provide a path to manufacture massive components for the realization of an optical quantum computer. The work was a joint effort of the Peking University, the Technical University of Denmark, ICFO, the Max Planck Institute of Quantum Optics, the Polish Academy of Sciences (PAS) and the University of Copenhagen. Wang J, Paesani S, Ding Y, Santagati R, Skrzypczyk P, Salavrakos A, Tura J, Augusiak R, Mancinska L, Bacco D, Bonneau D, Silverstone JW, Gong Q, Acin A, Rottwitt K, Oxenlowe LK, O'Brien JL, Laing A & Thompson M G 2018, 'Multidimensional quantum entanglement with large-scale integrated optics', Science, 360, 6386, 285. 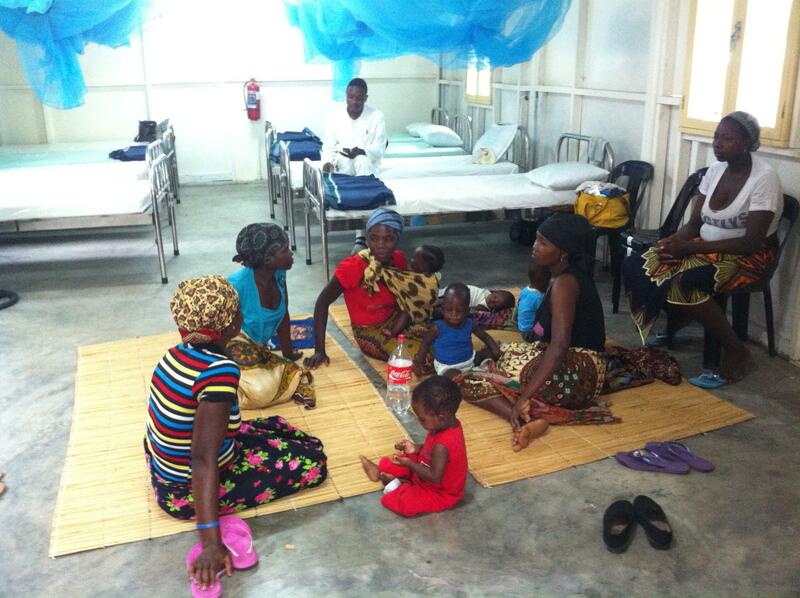 Paediatric-friendly formulations for the treatment of infants with malaria are scarce. A multicentre Phase II trial in sub-Saharan Africa, led by the Barcelona Institute for Global Health (ISGlobal), showed that a water-dispersible tablet is safe, efficacious and easy to administer to young children with uncomplicated P. falciparum malaria, and should set the basis for improving treatment compliance and efficacy in the population-group at most risk of developing life-threatening complications. Eurartesim™, a fixed-dose combination composed of dihydroartemisinin (DHA) and piperaquine phosphate (PQP), has been adopted by several endemic countries as first-line treatment of uncomplicated malaria due to its longer half-life and long post-treatment prophylactic effects. However, as infants and very young children are generally unable to swallow pills, Eurartesim™ tablets need to be crushed and mixed with water, resulting in possible loss of active ingredients and under-dosing. In addition, crushed antimalarial tablets have an unpleasant bitter taste causing children to spit them out. To overcome these problems, a new water dispersible tablet of DHA/PQP was developed for oral administration in infants and young children and tested in a large phase II multicentre trial with 300 African infants (6–12 months of age) from Mozambique, Burkina Faso, The Gambia, DR-Congo and Tanzania. Safety and efficacy was compared to that of the marketed tablet. Results showed that a standard three-day treatment with the new dispersible DHA/PQP paediatric formulation is as efficacious as the crushed Eurartesim™ tablets and has a comparable safety profile. “This highly efficacious formulation should be made readily available to all children below 5 years of age” says Quique Bassat, ISGlobal researcher and principal investigator of the study. 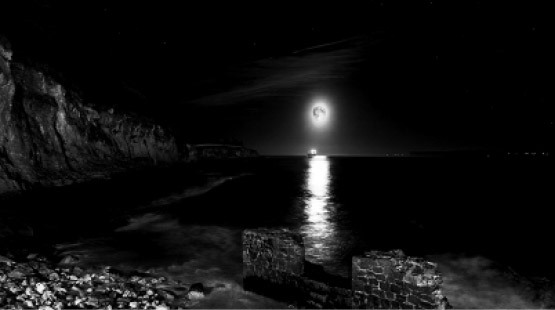 “It is easy and safe to administer, and provides better grounds for enhanced compliance and effective treatment. This should facilitate drug registration by Regulatory Authorities, prequalification by WHO and, finally, its full adoption in malaria control programmes". Gargano N, Madrid L, Valentini G, D'Alessandro U, Halidou T, Sirima S, Tshefu A, Mtoro A, Gesase S, Bassat Q 2018, 'Efficacy and Tolerability Outcomes of a Phase II, Randomized, Open-Label, Multicenter Study of a New Water-Dispersible Pediatric Formulation of Dihydroartemisinin-Piperaquine for the Treatment of Uncomplicated Plasmodium falciparum Malaria in African Infants', Antimicrobial Agents And Chemotherapy, 62, 1, e00596-17. Colorectal cancer (CRC) kills around 700,000 people worldwide every year. The majority of these deaths are the result of the dissemination of the disease to foreign organs. The emergence of new treatment options for patients with late-stage CRC has extended survival periods, yet metastases remain incurable in the majority of patients. Our lab generated for the first time genetically engineered mouse models that develop aggressive human-like CRCs. Analysis of the process of metastasis in these mouse models revealed that tumor cells build an immunoprivileged microenvironment during organ colonization, that promotes T-cell exclusion and blocks the acquisition of an anti-tumor immune effector phenotype. We showed that this mechanism depends on elevated levels of the hormone TGF-beta present in the microenvironment of these metastases. Inhibition of TGF-beta signaling reverts this process and unleashes a potent cytotoxic T cell response against tumor cells, which is long lasting and protects mice from metastatic disease. In mice with progressed liver metastatic disease, blockade of TGF-beta signaling rendered tumors susceptible to anti-PD-1/PD-L1checkpoint immunotherapy. We show that dual TGF-beta/checkpoint therapy cures mice suffering from overt metastatic disease. Our findings suggest that TGF-beta signaling inhibitors may have broad applications to treat patients with advanced CRC. Their efficacy will soon be tested in clinical trials. Left panel presents a CRC metastasis, with associated fibroblasts secreting TGF-beta and impeding the infiltration of T cells. 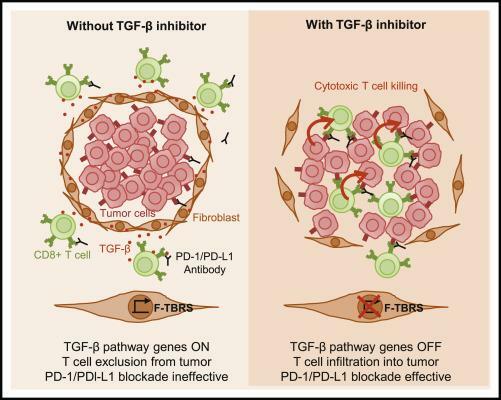 Upon treatment with TGF-beta inhibitors (right panel), this immune evasion mechanism is blocked and T cells penetrate the tumor. This process renders metastasis susceptible to the therapeutic action of PD1/PDL1 immunotherapies. Tauriello DVF, Palomo-Ponce S, Stork D, Berenguer-Llergo A, Badia-Ramentol J, Iglesias M, Sevillano M, Ibiza S, Cañellas A, Hernando-Momblona X, Byrom D, Matarin JA, Calon A, Rivas EI, Nebreda AR, Riera A, Attolini CS & Batlle E 2018, ‘TGFβ drives immune evasion in genetically reconstituted colon cancer metastasis’, Nature vol. 554(7693), pp.538-543. - This work received multiple News & Views and Editorial Highlights: Science Signaling; Nat Rev Gastroenterol Hepatol, Nat Rev Clin Oncol, Nat Rev Cancer, Nat Rev Immunol, Trends in Cancer (10.1016/j.trecan.2018.03.005), Trends in Immunology, Immunity (doi.org/10.1016/j.immuni.2018.03.037), British Journal of Cancer (doi.org/10.1038/s41416-018-0122-x), and Cancer Discovery. Using social-network methodology, we asked Moroccan, Pakistani, Ecuadorian, and Romanian immigrants residing in Barcelona to nominate 25 individuals (i.e., alters) representative of their habitual social networks and to provide demographic (e.g., ethnicity), relationship type (e.g., family, friend, neighbor), and structural (who knew whom) information for each of these alters. Even after controlling for individual-level demographic variables (e.g., time in Spain, income, education), the content and structure of these immigrants’ personal social networks predicted their level of adjustment (both psychological and socio-cultural) and their feelings regarding how compatible their ethnic and Catalan cultures are. Specifically, the overall degree of cultural diversity in the network, the amount of Catalan (but not Spanish) “weak” ties (i.e., acquaintances, colleagues, neighbors) in the network, and the amount of interconnectedness between local coethnic and Catalan/Spanish alters positively predicted the above adjustment outcomes. Furthermore, against a “culture and language similarity” hypothesis, Moroccan and Pakistani participants had social networks that were more culturally well-integrated, relative to Ecuadorians and Romanians. Results from this study attest to the importance of examining actual intercultural relations and going beyond individuals’ verbalized acculturation preferences to understand immigrants’ overall adaptation and cultural identity dynamics. 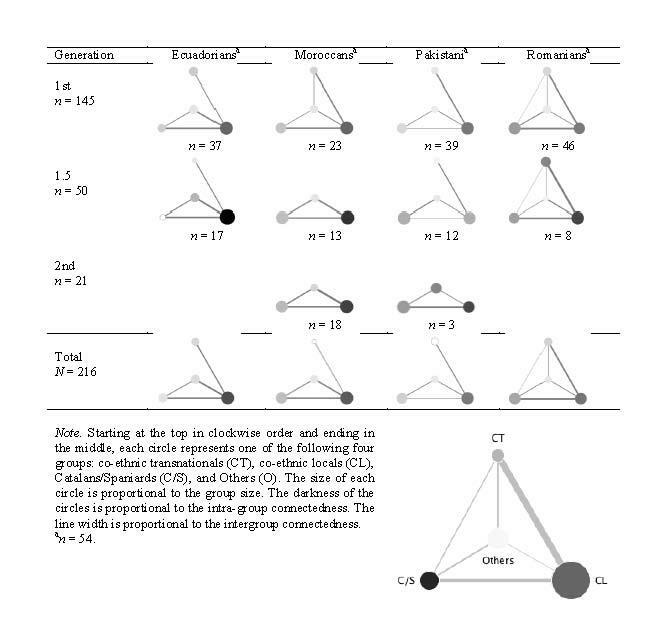 Lastly, results highlight the interplay between interculturalism experienced at the meso, interpersonal level (i.e., having culturally diverse networks that also include ties between ethnic and Catalan alters) and intra-personal, subjective level (i.e., feeling that ethnic and Catalan cultures are compatible). Repke L & Benet-Martinez V 2018, 'The (diverse) company you keep: Content and structure of immigrants' social networks as a window Into intercultural relations in Catalonia', Journal of Cross-cultural Psychology, 49, 924-944. Visualizing and quantifying tissues and organs at a microscopic level of detail has always been an important tool for biomedical research and daily clinical practice. While many microscopic approaches exist nowadays, only recently there are possibilities to study large pieces of tissue or complete organs at high resolution and in 3 dimensions. However, on the one hand, most techniques still require a lot of tissue processing like fixing, staining or optical clearing to use the (mostly optical) imaging approaches. On the other hand, there are the clinical imaging modalities such as X-ray computed tomography, magnetic resonance and ultrasound imaging which provide great information in clinical practice but have limited resolution or contrast, especially for soft tissues. 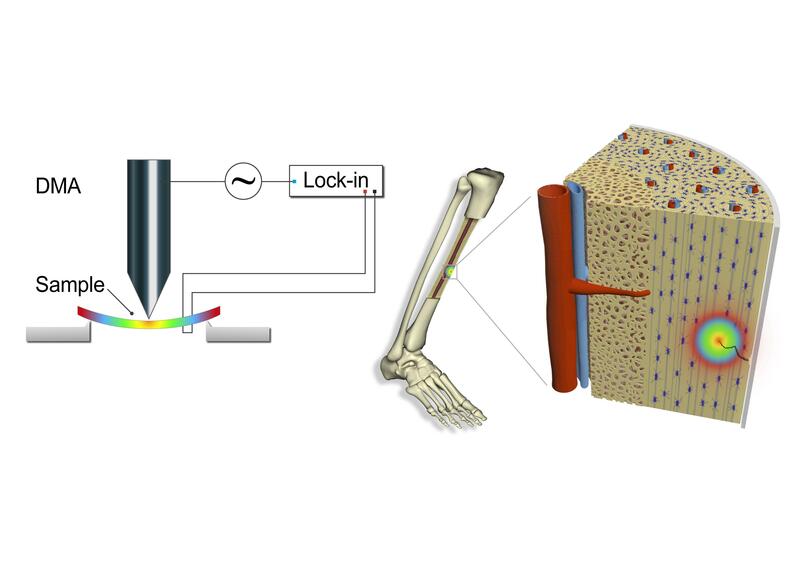 Recently, we have shown that using wave-propagation properties of X-rays, rather than only X-ray absorption by tissues, provides a novel way to look at unprocessed tissues and even organs with great contrast and resolution [1,2]. This novel X-ray phase-contrast tomography (X-PCI) requires bright and coherent X-ray beams, which currently can only be produced using synchrotrons, namely large electron accelerators producing bright photon bundles, predominantly for research purposes. 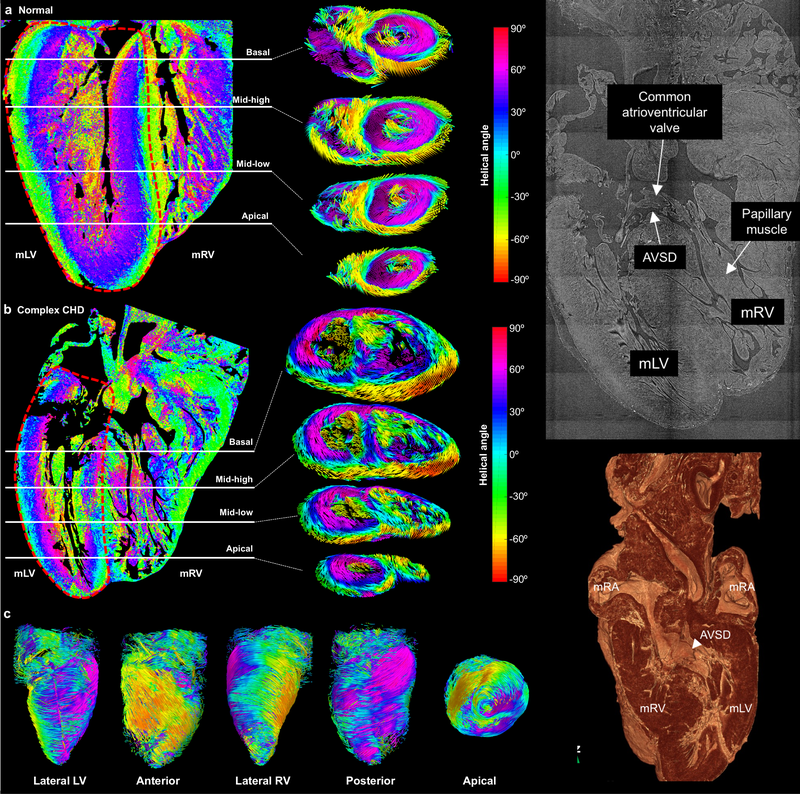 The images below show examples of where this approach can shed light and understanding on microscopic tissue remodelling associated with cardiovascular diseases. Fig 1 shows the damage to the elastic laminas of the aorta in (mouse) Marfan syndrome, of which it is known that patients show gradual damage and enlargement of their aortas, often requiring replacement surgery by the age of 40. Fig 2 shows microstructural details of the heart of a normal human fetus as well as a fetus with congenital heart disease, where the homogeneous unique pattern of cardiac muscle cell orientation is importantly distorted, thus leading to an intrinsic inefficient heart muscle and problems to pump blood around. Damage of the elastin laminas in mouse aortas associated by Marfan Syndrome. 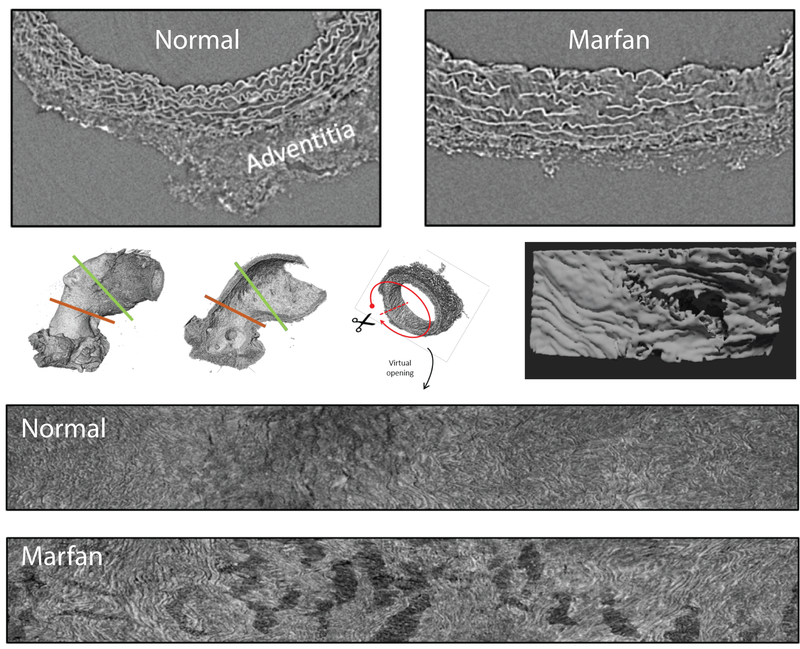 The top images show local cross-sections of the aorta in adult control and Marfan mice where the interruption of the elastic lamina in Marfan can be clearly observed. Given the 3D nature of the data, a single lamina covering the whole aorta can be isolated and shown (bottom) on a 2D flattened surface to clearly show the fenestrations associated with the disease and which lead to aortic weakening, dilatation and potential rupture. Using X-PCI, details on the microstructure within the whole heart can be studied at the micrometre scale. From this, the local change in orientation of the cardiac cells can be extracted, which changes gradually and homogeneously through the cardiac wall as shown in the top image for a normal human fetal heart (around 20 weeks of gestation). When complex congenital heart disease is present, this highly organized pattern is clearly distorted in different regions of the wall. This has an important influence on the performance of the heart and will determine the therapeutic strategies for babies born with these conditions. Garcia-Canadilla P, Dejea H, Bonnin A, Balicevic V, Loncaric S, Zhang C, Butakoff C, AguadoSierra J, Vazquez M, Jackson LH, Stuckey DJ, Rau C, Stampanoni M, Bijnens B & Cook AC 2018, 'Complex Congenital Heart Disease Associated With Disordered Myocardial Architecture in a Midtrimester Human Fetus', Circulation-cardiovascular Imaging, 11, 10, e007753. Lopez-Guimet J, Pena-Perez L, Bradley RS, Garcia-Canadilla P, Disney C, Geng H, Bodey AJ, Withers PJ, Bijnens B, Sherratt MJ & Egea G 2018, 'MicroCT imaging reveals differential 3D micro-scale remodelling of the murine aorta in ageing and Marfan syndrome', Theranostics, 8, 21, 6038 - 6052. Bones have a remarkable ability to fix their own fractures. It has long been known that the repair is carried out by specialized cells. It has also been known for a long time that bones generate electricity in response to mechanical efforts. How, or whether, the self-repair process and the electromechanical properties are related has been less clear until now. The ability of bones to generate electricity in response to pressure (known as piezoelectricity) is itself a bit of a mistery, because the mineral component of bones, hydroxyapatite, is not piezoelectric. Scientists have therefore attributed the piezoelectric properties of bone to its main organic component, collagen, which is piezoelectric. However, we have discovered that, even if all the collagen is removed from a bone, it can still generate an electric signal in response to bending. This property is known as “flexoelectricity”, and hydroxyapatite has it. Moreover, when calculating the flexoelectric fields generated around the apex of a bone fracture, we have discovered that they are theoretically large enough to stimulate a strong cellular response from the cells near the fracture. The electromechanical link between fractures and repair cells is thus established: when we put pressure on our bones, their fractures will emit an electric signal that acts as a “starting shot” for the initiation of the repair process by the cells. Being very localized around the fracture apex, it also serves as a guiding light to direct the cells to the centre of damage. We hope that this discovery will stimulate the investigation of therapeutic and prosthetic uses of flexoelectricity. Vasquez-Sancho F, Abdollahi A, Damjanovic D & Catalan G 2018, 'Flexoelectricity in Bones', Advanced Materials, 30, 9, 1705316.